About 2,000 electric poles got uprooted plunging most of Srikakulam district into darkness. SRIKAKULAM: Eight people died and three fishermen went missing at sea after the very severe cyclone Titli made landfall between Palle Saradhi and Gollapadu villages in Vajrapukotturu mandal of Srikakulam district early Thursday. Titli which hit the coast between 4:30 and 5:30 am, left a trail of destruction in Srikakulam and Vizianagaram districts. Thousands of trees were uprooted and many fell on the National Highway 16 causing traffic disruption. Hundreds of coconut, cashew and banana plantations were ravaged and the worst-affected was Uddanam region, where majority of people depend on coconut plantations and other horticulture crops for livelihood. Standing crops in thousands of acres were inundated causing severe loss to farmers. About 2,000 electric poles got uprooted plunging most of Srikakulam district into darkness. At several places, cellular towers were also damaged affecting the communication network in the two districts. Roofs of thatched houses were blown off due to gales. At Lakkavaram in Sompeta mandal, about 15 container trucks overturned on NH 16 due to strong gales. At Palasa and some other railway stations, platform roofs were blown off and the debris fell on railway tracks. The highest rainfall of 42.6 cm was recorded at Booravilli village in Gara mandal. 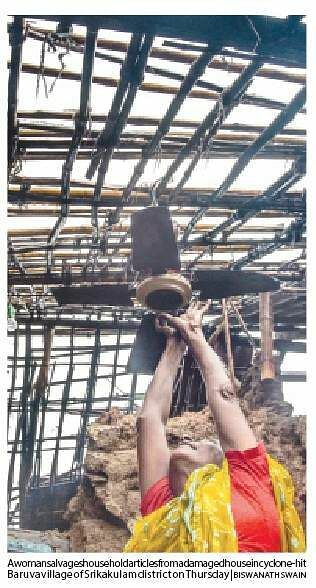 One M Surya Rao (55) died when the roof of his house collapsed at Sarubujjili village. Appala Narasamma (62) was killed at Vangara when an uprooted tree fell on her. 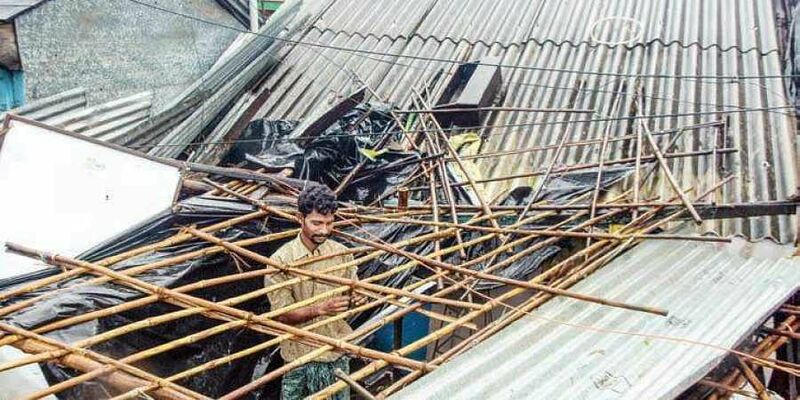 In a shed collapse, R Gomango (20) died at Yellampeta. M Santhosh Kumar (28) and Ippali Kamaiah (53) of Suvaranapuram village in Mandasa mandal died in a wall collapse. B Durga Rao (50) of M Sunnapalli, Appalaswamy (56) of Vadi Tandra in Santhabommali mandal and Kolli Lakshmamma (70) of Tekkali also lost their lives in rain-related incidents. Three fishermen from Vizianagaram, identified as Surada Ramu, Vasupalli Lakshmana Rao and Badi Sattaiah, were reported missing at sea. Indian Coast Guard has launched search operations for the missing fishermen. Seven of the 150 fishing boats from Visakhapatnam which ventured into the high sea, were reported missing and search is on for them. Meanwhile, 67 boats that left Kakinada coast, returned to harbour safely. Meanwhile, more rain is forecast in the next 24 hours by weathermen. Fishermen have been advised not to venture into the sea. According to IMD, the wind speed at the time of landfall of the cyclone was around 165 kmph. Heavy rain, accompanied by gales, are likely to continue till Friday. Special teams from Guntur and Godavari districts rushed to Srikakulam in the afternoon to take up relief operations and restore power supply and communication network. NDRF teams had also taken up relief operations in the cyclone-affected areas. As a precautionary measure, several trains bound for Odisha were terminated at Visakhapatnam itself. APSRTC suspended bus services in cyclone-hit areas of Srikakulam and Vizianagaram. Power supply was stopped at several places as a precautionary measure. At Uppada in East Godavari district, seawater entered some houses. The beach road between Uppada and Kakinada was badly affected due to rough sea. 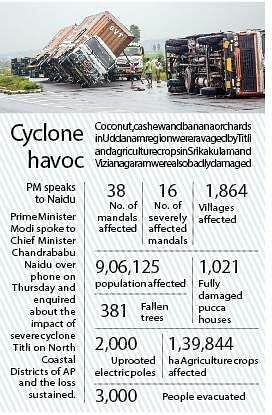 Chief Minister N Chandrababu Naidu monitored the situation through the Real-Time Governance Department from Wednesday night to 4 a.m on Thursday and directed the officials to initiate measures to minimise cyclone losses. Later in the evening, Naidu flew to isakhapatnam and from there he took the road to reach Srikakulam to monitor relief operations in the cyclone-hit areas.